BCH service Included! PERFECT FOR FAMILY GETAWAYS;;;; GORGEOUS LAKE VIEWS! Spacious, open, and inviting, this ground floor Villa is located on the Lake and adjacent to the heated pool at Hidden Dunes. Beach service is included with this rental in season. (2 chairs and 1 umbrella) The view from the great room or screened porch is spectacular and you are only a 2 minute walk from the beach. The kitchen has been recently updated with stainless steel appliances, new cabinets and the laundry room has an additional beverage fridge. The bedroom floors have been updated with wood look porcelain tiles. The screened porch directly overlooks the lake, making it the perfect place to relax. The resort is know for it's 6 tennis courts, 3 community pools, and relaxing atmosphere. The resort also has a basketball court and its own restaurant. 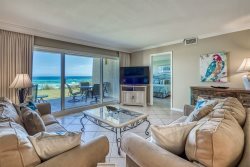 No only does Hidden Dunes offer these amenities, but it's located a half mile from Sandestin and the Silver Sands Outlet Mall, making it a great location for the whole family. Add $150 for housekeeping and 11% for tax. There is a $69 damage waiver, $30 Booking Fee, and 2.50% fee to process credit card payments. A deposit of 25% holds the unit for you and is applied toward the rental fee.